Rollin' down the river with Proud Mary and her krazy krewe! : Toy Story 3 On ICE! Toy Story 3 On ICE! 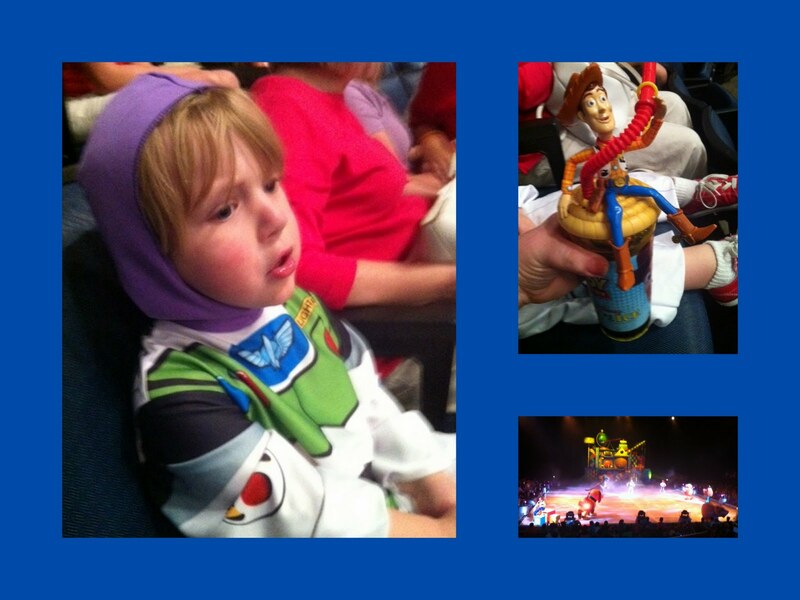 This past Saturday I took Noah to Toy Story 3 On Ice. To get him excited, we would show him clips on You Tube and he was MORE than excited to go. We woke up that morning and I told him he could wear his Buzz costume or a Buzz shirt, he opted for the costume. That wasn't a shock, any chance Noah can dress up he takes it! As soon as we walked into the Arena we were bombarded with over priced options. First, I opted for the $15 picture with the Toy Story backdrop but gave Noah the option of either the picture OR a sno cone. He chose the sno cone. Well, the sno cones ranged from like $10-$15 or more. The mugs were adorable but all of them but one were open containers. I showed Noah the $10 cup that had a top and he went for it. Score! I'd rather not have both of us drenched in red dye and it did have a super cool Woody top and straw. We then made our way to our seats and they were great. Noah could totally see and was very excited. Of course, they have guys trying to sell you a $22 light up spinning toy along with $20 cotton candy. I told Noah we'd pass on both of these and at first he was upset but he quickly got over it. The show was adorable! It opened with Mickey, Minnie, Donald and Goofy coming out and Noah kept on gasping. "Mommy, it's Mickey...MICKEY MOUSE! LOOK LOOK!" it was adorable. Then the evil emperor ZURG came out and Noah got a bit upset. "Mommy, can you hold my hand? Zurg scares me!". Aww. However, if he you ask Noah his favorite part he quickly says "ZURG!!!". He is crazy. The least favorite part? Oh, that's when Noah peed all over himself and a puddle ensued by our feet. No joke. Noah isn't potty trained yet and if you ask him he politely says "No, thank you! ", so he is still in a diaper. We changed him right before he left and the show was 2 hours, so I have no idea how this diaper leaked...big time. It was about 3/4ths way into the 2nd act and Noah looks at me "Mommy, I'm going pee pee" and I told him it's okay and he just looked at me with the biggest eyes. I put my hand around him and just feel him completely drenched. Ick! I looked down and there was a puddle of pee. Not just a little wetness...a puddle. Eww! Ahh! We went to the restroom and I had to change his clothes. Poor thing, he didn't want to put on clothes he wanted to be Buzz! Thankfully the show was practically over and we saw the last few parts before heading home. However, they were the "scary" parts and Noah didn't care about not being as close in our seats to see this. He wanted me to hold him the whole time. Minus the potty accident, we had a great time! I was very hesitant to take Noah because I didn't think at 3 he would have the patience but he proved me wrong. If it comes to your city, go see it! You won't be disappointed.